In the last two months since I have really engaged with social media, I have had the pleasure of making the acquaintance of some of the most wonderful people I have ever had the privilege to know. And the glorious thing is that they are all either autistic, neurodiverse, or autism parents. They have shared their insights with me through their own blogs and have taught me so much about what it is to be autistic; about different ways of communicating with one other to reach understanding and friendship. They have enriched my life beyond measure with their intelligence, compassion and brilliant writing. 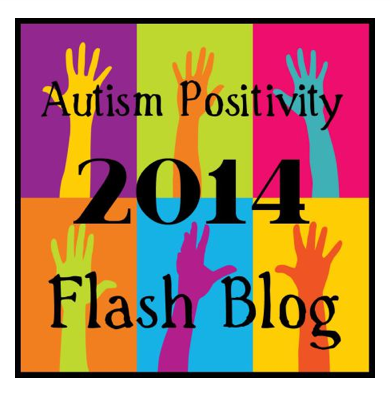 This is my first ever proper blog really and it comes in honour of the Autism Positivity Flash Blog Day 2014. I want simply to add my voice to these many voices that have been inspiring and guiding me. There have also been so many others, it would take me an age to list, and I am so grateful to you all. My name is Helen Le Brocq, I am a proud autism parent and wife. I am Director of OYAP Trust, a youth arts charity based in Oxfordshire, England. I am a theatre practitioner by trade, and I now develop irresistible projects for young people to engage with artists and transform their lives through creativity. My practice is to develop projects that help every young person find and value their own unique creative voice. We often work with young ASC artists whose work has always been unexpected and full of delight! So finally and most importantly I want to introduce you to my ten year old son, Aidan Luck. He has atypical Asperger’s and ADHD. He is funny, quirky, adorably affectionate, kind and loving – and it turns out he is very wise! And he is the greatest gift you could ever hope for – I would not change a single thing about him. I made this short film with him recently for Sonia and Brent, and now I would like to share it on this #AutismPositivity2014 day. It’s his voice that matters, and I add it to help grow acceptance and pride in our autistic children, brothers and sisters. It’s just a little thing, but I offer it with love. This is Aidan Luck, also on the subject of friendship.